We recently published the first paper from my post-doc in Forest Ecology and Management, so I thought I’d share it here. 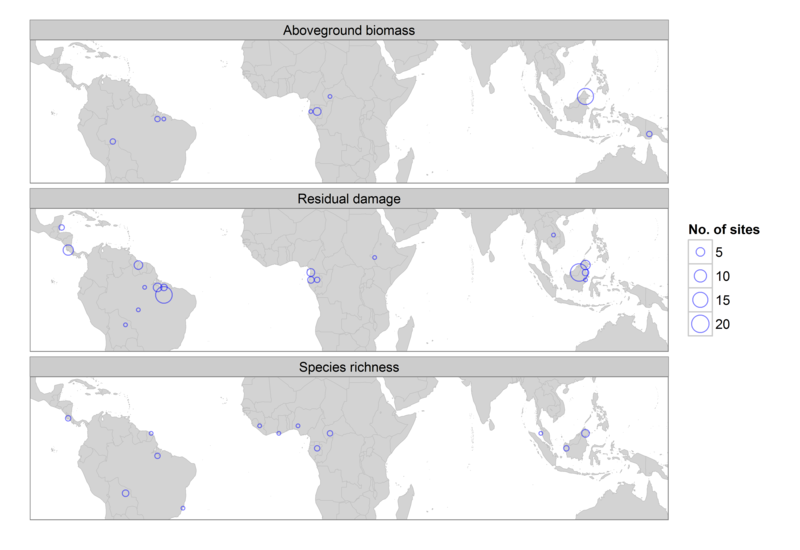 It marks a bit of shift away from the tropical forests I have previously published about (see posts on that here and here), but it allowed me to continue my work on post-disturbance recovery. Scientists and policymakers around the world are concerned about the potential effects of forest dieback. Drought and the spread of new pathogens and pests have resulted in increased tree mortality in both the USA and Canada, and these threats are likely to increase in Europe as well. The IPCC recently highlighted forest dieback as a potential major threat, but one about which we know relatively little. Changes in forest biodiversity and ecosystem services are likely to be particularly severe in ecosystems that show poor resilience. Failure to withstand or recover from drought or pest attack may lead to ‘regime shifts’ resulting in a very different type of system, with many fewer trees. Luckily for our group my boss, Adrian Newton, found out about a permanent transect that had been set up in the 1950s in a woodland in the New Forest that now appears to be suffering from dieback. The site had been surveyed 4 times between 1964 and 1999, and our team collected more data from the site in 2014. 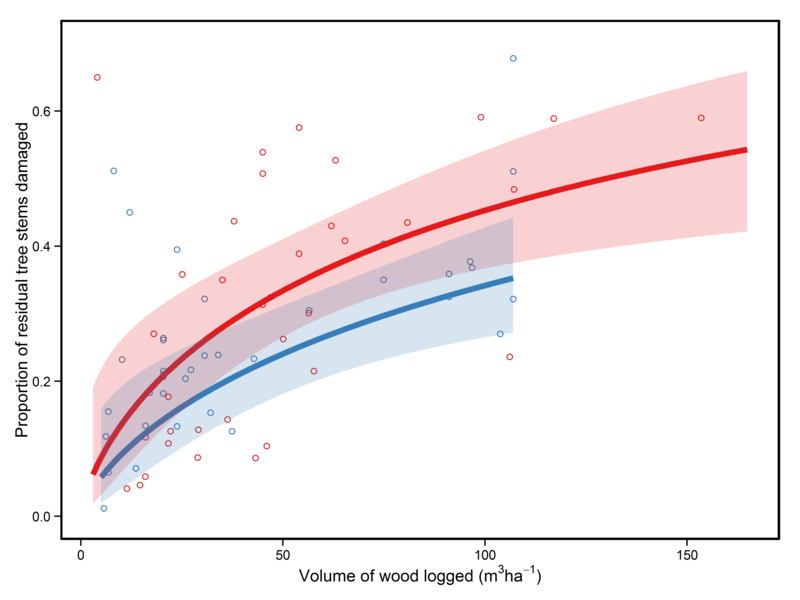 In our recent paper, published in Forest Ecology and Management we used this data to investigate dynamics of the woodland. 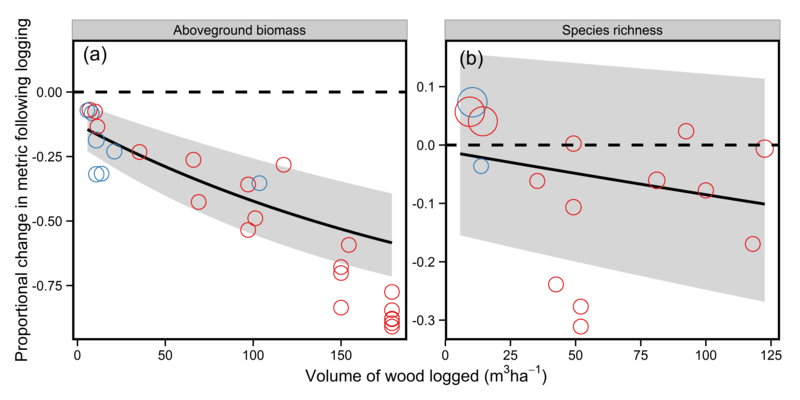 In particular, we addressed the potential impacts of dieback on forest structure, the causes of these changes and their impact on biodiversity. To cut a long story short, the forest lost about a third of its basal area (as you can see above) and over two-thirds of its juvenile trees over 50 years. over 90% of the loss of basal area was due to the death of large beech (Fagus sylvatica) and oak (Quercus rubor) trees. 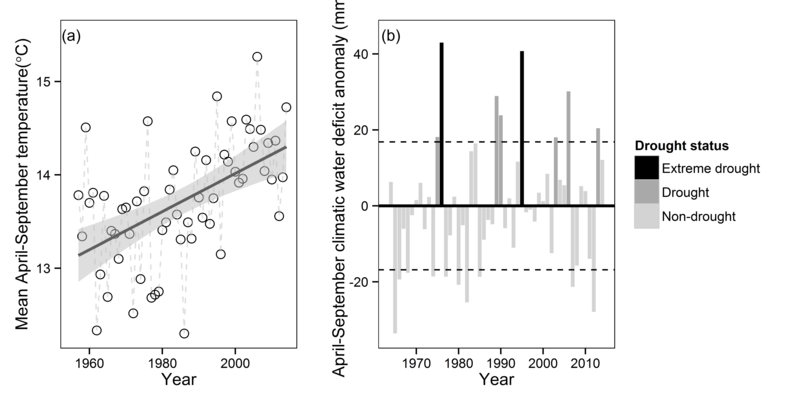 Climate records from 1964-2014 showed that (a) mean temperature during April-September increased from 1960s to present day; and (b) there were numerous drought years post-1976 a year which was previously identified as a cause of current mortality. The external factors causing these changes are not entirely clear, but there have been a number of significant droughts between 1964-2014 as well as increased temperatures (see figures above). In addition, the presence of a number of novel fungal pathogens has been noted in the forest, which may have interacted with drought to further weaken large trees. 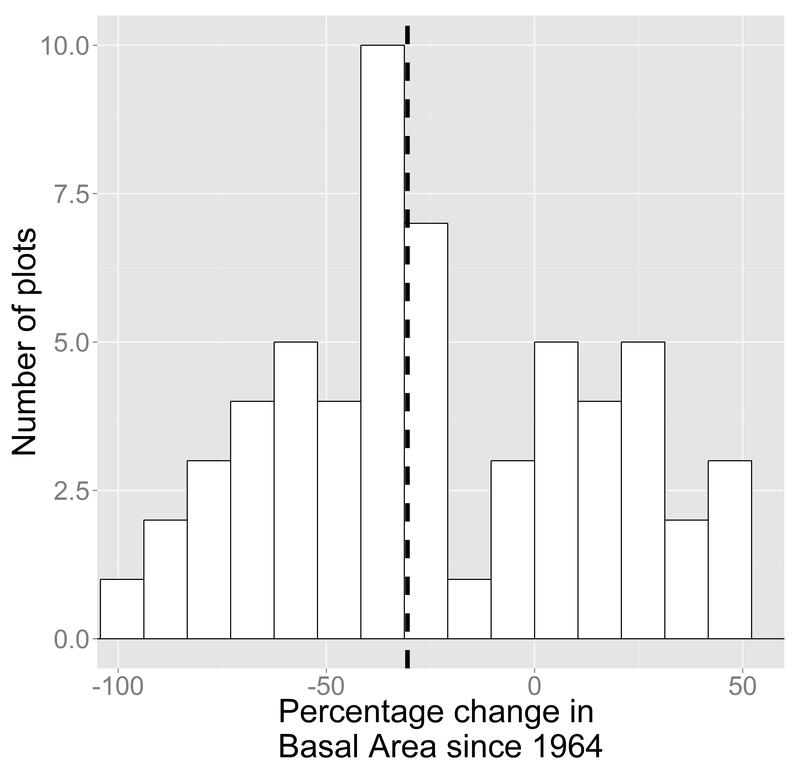 Recovery in the forest has been very limited, with almost no recruitment of saplings of the canopy dominants (beech & oak) in 50 years. This low recruitment is probably a result of the high density of ponies and deer in the woodland. 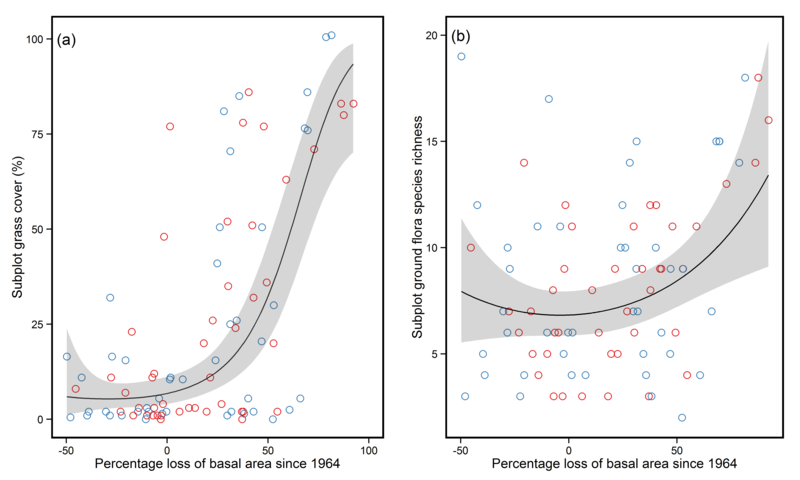 Relationship between percentage loss in subplot basal area and (a) percentage grass cover and (b) ground flora species richness. 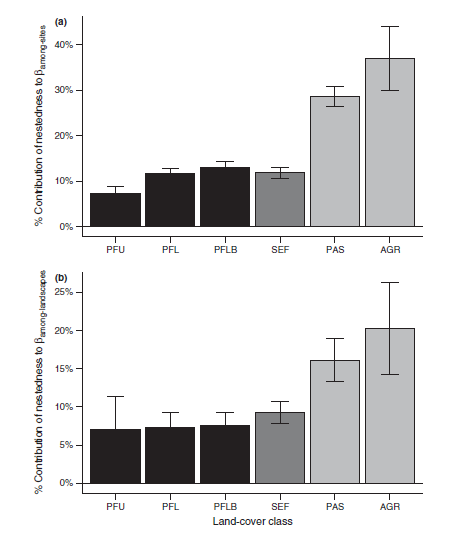 The result of the changes in forest structure is that areas with little tree cover have seen large increases in grass cover and increased ground flora species richness (see figure above). Both of these results indicate that there may be a tipping point at which changes in structure result in rapid increases in grass cover and species richness of ground flora. Many of the papers on resilience talk about alternative stable states, in which transitions from one type of system to another are difficult to reverse. Though, from the outside, it may appear that our field site shows evidence of a shift to a relatively treeless stable state, we think that this is incorrect. The theory underlying multiple stable states suggests that disturbances causing the regime shift should be a ‘pulse’, when disturbance occurs over a relatively short period and then does not occur again, rather than a ‘press’ disturbance, where the disturbance is present over long periods of time. However, these conditions are not met by our site where both pulse (i.e. drought) and ongoing press (i.e. overgrazing) disturbances are present. 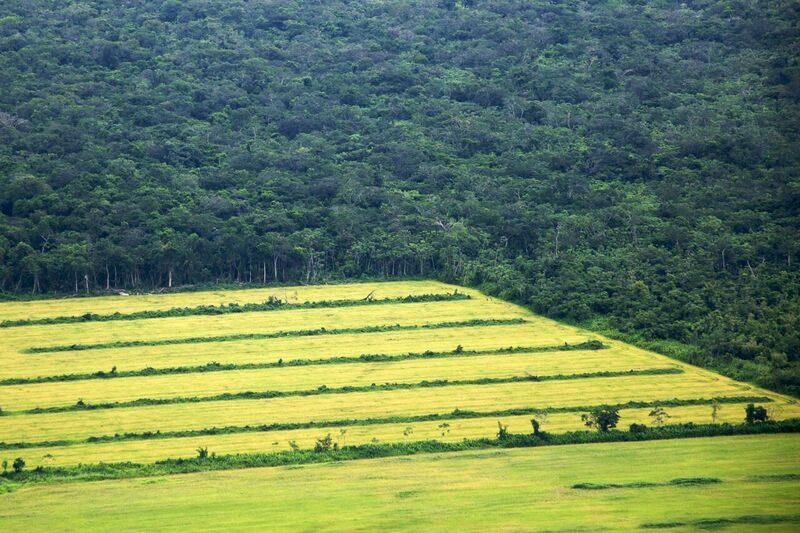 We think that both of these processes are needed to cause the forest to lose tree cover. Even if the transition we have observed is not strictly a ‘regime shift’ it’s still important. Dieback is apparently widespread in the New Forest and is on-going, so the potential impacts could be very significant. As with other cases of dieback it’s difficult to identify appropriate management responses. However, in the case of the New Forest the easiest way to restore resilience would be to protect tree regeneration from the high herbivore pressure in the area. If you want to read more about our study you can find the paper here and details of our project on forest resilience can be found here. Oh, and here’s a post I wrote about my project a while back. Also, feel free to comment below!